Police are becoming increasingly worried about a terrifying new technique burglars are using to break into people's homes. 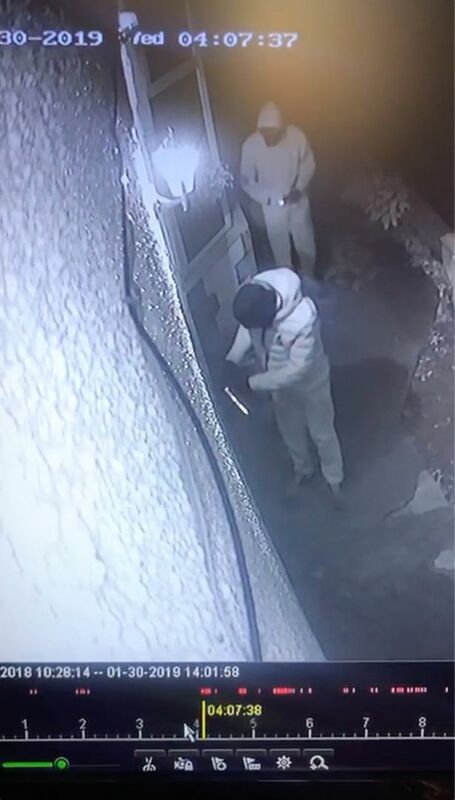 Two men wearing balaclavas were caught on camera using a blow torch to burn off the locks on the front door of a family home in Bradford. 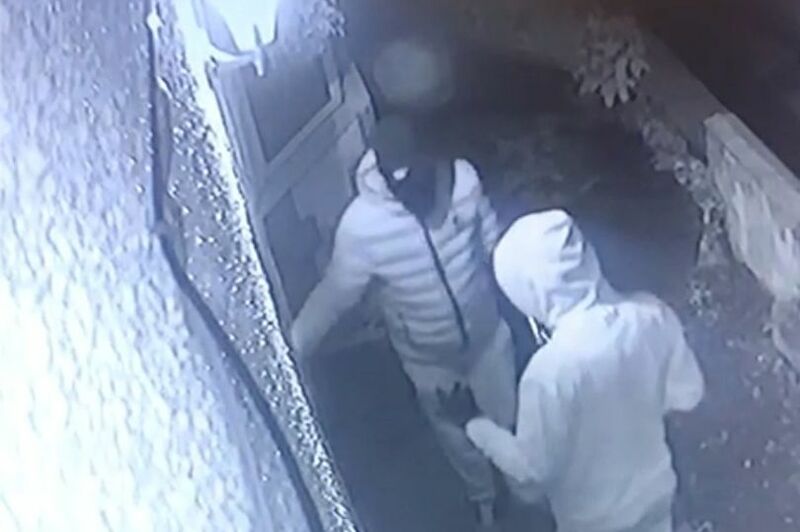 Once inside they grabbed a set of car keys and stole a £30,000 Audi S3 Quattro - even using the torch to defrost the windscreen before driving off. 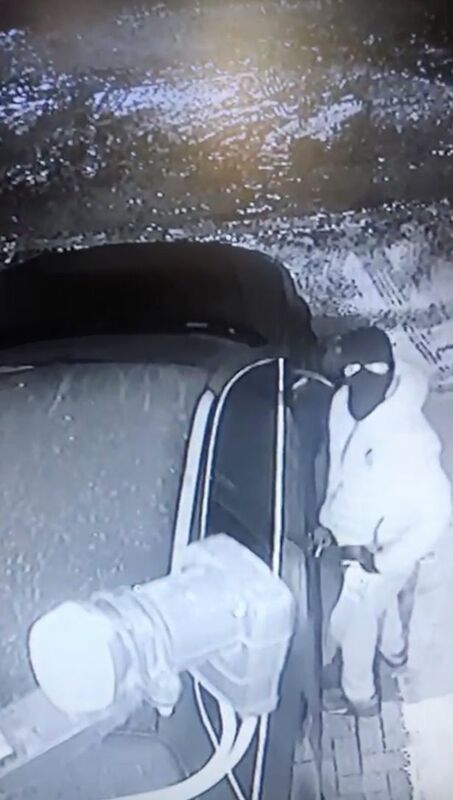 Police say the technique is becoming increasingly common as thieves come up with new and unusual ways to break into properties. The latest incident, which happened at 4am in the morning, follows a spate of similar crimes across the north of England. Police believe criminals are targeting homes with PVC doors, melting the locks to gain entry to the property. Taira Abdul-Khaliq, 41, who owns the car in the latest incident, said police had been unable to find any evidence at the scene due to the burnt out locks. She said: "I'm so angry, it's unbelievable. "I'm off work at the moment because I'm furious. It's a violation. They came in with blowtorches. "I work in a local school and there's not many women who drive high-powered cars so lots of people know who I am. "We were advised by police that if burglars break in, they'll come and wake you up for car keys and they might hurt you. "So every night, we leave the keys on the stairs so they don't come and threaten us. "And that's exactly what they did, they searched our coats, stole our wallets and then started coming upstairs." Last April, police in Bradford warned of at least eight incidents where a blowtorch was used to gain access to a house. Other burglaries involving the flame-throwers have been reported in Sedgefield and Newton Aycliffe, County Durham, and Sutton-in-Craven and Crosshills, north Yorkshire and Keighley and Bingley, west Yorks. As the pair drove away, Taira's phone briefly connected with her car's dash cam and recorded the burglars' comments as they realised the windscreen was iced up. Clearly unable to see, one of them can be heard saying: "Lighter...get the lighter. Stick your head out of the window man! Teacher Taira added: "It's just a few seconds but I can hear their voices and they're local. "It's so upsetting, it could be anyone I know. "My neighbours' CCTV captures them using the blowtorches down the road to defrost the windscreen. "I couldn't believe it when I saw it. "That car was beautiful. Everything I had I put into that car - I don't drink, smoke or go out clubbing. As long as I had my car, I was happy. "It was a beauty, there's no car like it. My husband and I have been trying for children for a long time and I went for IVF. "I had a horrific experience where it went wrong and they found a 2cm polyp which they had to test for cancer. "After that, when I received the all clear, I said to my husband that I was going to treat myself and this was my gift." Craven Inspector Geoff Crocker urged homeowners to update outdated locks and review their home security. He said last year: "I want to reassure the public that we are doing everything we can to apprehend the criminals who are committing these crimes. "I would also recommend that residents review their home security arrangements and consider having snapsafe locks fitted to external doors front back and patio doors." Julie McCulloch, from Keighley, was one of those targeted last May. Thieves melted the door of her family home in a bid to steal her son's week-old Audi A3. Although they left empty-handed, the 50-year-old said at the time: "They are just horrible. It's awful. I'm shaken up, but relieved they didn't get in." Anyone with information is asked to contact police on 101, quoting crime reference 1319005357. To give information anoymously, call Crimestoppers on 0800 555 111.